Vincci shares her current work space, how therapeutic diets can become problematic, the factors that led to and experience working in a bariatric clinic, the issues with weight-centred health professionals ‘co-opting’ the non-diet/HAES language, transitioning to a non-diet/HAES model, acknowledging privilege and ‘bringing yourself into the room’ while with clients and why collaboration between HAES/non-diet and ‘obesity prevention’ professionals is so hard. Her current work space; both private and clinical, and the welcomed new inclusion of Gastrointestinal (GI) patients. The misconceptions of FODMAP, how therapeutic diets can become problematic and how we, as clinicians, can contribute to this. The factors that led Vincci to work in a bariatric clinic and her experience working within this weight centric model. The issue with weight-centred health professionals ‘co-opting’ the non-diet/HAES language. Transitioning to a non-diet/HAES model and the resources/people which helped guide her on her journey. The importance of acknowledging privilege and ‘bringing yourself into the room’ to provide a richer experience for clients; ‘we cannot remain neutral!’. Attending the ASDAH conference in August. Why we need to go deeper than the ‘palatable’ stuff, be conscious of our language and not always be nice and restrain ourselves. 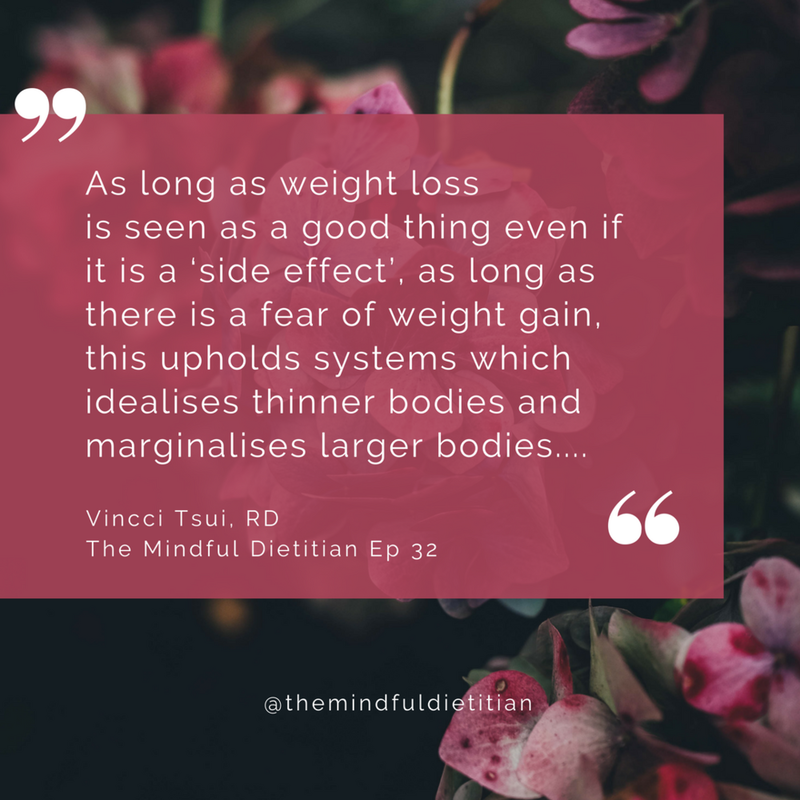 And something you may not have known about Fi (The Mindful Dietitian)! Vincci is a non-diet Dietitian, Certified Intuitive Eating Counselor and Health At Every Size® advocate. Within her private practice, Vincci takes a collaborative and compassionate approach to support and guide her clients to find freedom in their relationship with food and body. Vincci also supports outpatients within a chronic disease management program which will also shortly include GI patients; a welcomed new and exciting challenge. Vincci was born in Hong Kong and raised in Calgary, Canada, where she currently resides. Before transitioning to a non-diet/HAES paradigm, Vincci worked within a weight centric model to include non-surgical weight management, bariatric surgery preparation and complete bariatric clinic work. From this experience, Vincci brings a curious, open heartened attitude to what we are still yet to know in this paradigm.